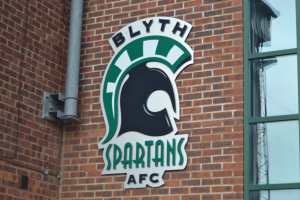 Blyth Spartans were among the North East Non-League clubs who were received special recognition from the North East Football Writers’ Association for their achievements in the 2016-17 campaign. The annual awards ceremony – which was hosted was Ramside Hall, Durham – took place on Sunday night, with three clubs given special commemorated. Alongside South Shields and Spennymoor Town, Spartans were in the spotlight having lifted the Evo-Stik North title on their first return to the National League North since 2012. Further acknowledgment was given for their Northumberland Senior Cup success after the 3-2 win over North Shields at St James’ Park in May secured a cup-double. Not only have Spartans established themselves in the second tier of the Non-League pyramid, manager Alun Armstrong has led the club into an unexpected play-off push – sitting in fourth place with 10 games remaining. Blyth chairman Tony Platten was representing the club at the event, and spoke very highly of Armstrong. “Had I been offered fourth in the league running into the beginning of March, I would have snapped somebodies hand off for that,” Platten told former Spartans Press Officer, Mark Carruthers. “Alun’s done a fantastic job – managing the team since he took over the reigns last season – and to be outperforming the way we are, knocking in goals again for fun – really good! “We’re winning at York, we’re winning at Stockport, these are big league clubs in the past, it shows a tremendous change that Alun’s brought to the team in terms of discipline, in terms of effort and the way we play.